Mother Nature is getting her brush out because it appears that she is going to brush parts of the KFVS viewing area with a little snow. Let me first say that right now it looks like most of the KFVS viewing area will not going to get snow from the Sunday/Monday system*. Areas that could get a little snow will be the Missouri bootheel, northeast Arkansas, northwest Tennessee and the extreme southeast corner of western Kentucky (i.e. Calloway County, Ky). This morning's Global forecast model continues the trend of keeping the surface low of the storm along the gulf coast with moisture spreading north. 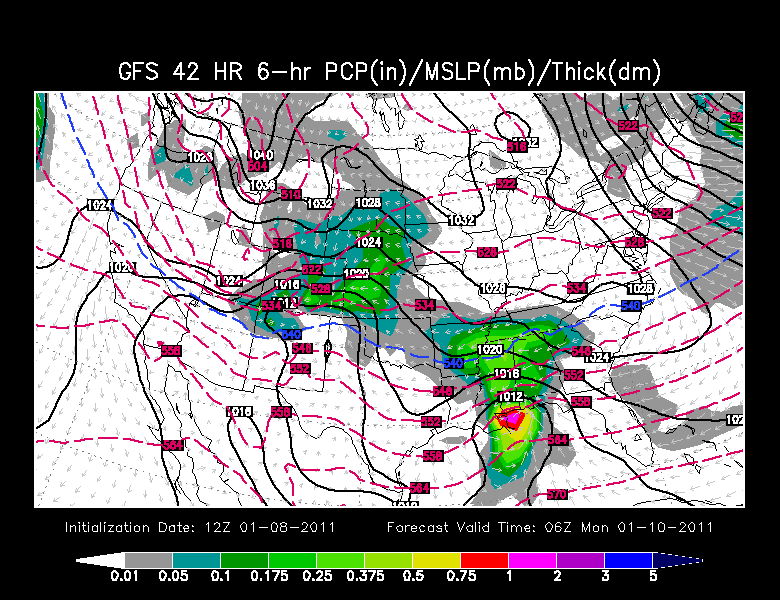 Here is this morning's 12z run depicting 12am CT Monday. You can see how the northern edge of the moisture brushes the southern edge of the viewing area. Last night's Canadian model shows the same thing. 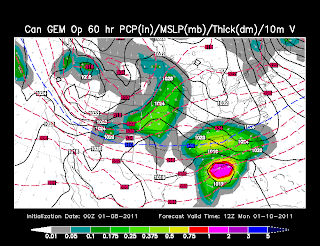 Here is the model's depiction of 6am CT Monday. The only difference between this model and the previously mentioned model is that the Canadian brings a little bit more moisture further north and brings 0.5" of snow to a rough line from Sikeston, Mo to Shawneetown, Il. Notice that I put an asterisk earlier in the blog. Just because you don't get any snow Sunday/Monday doesn't mean you won't see any snow. There is a second round to the storm that will move through early Tuesday morning. 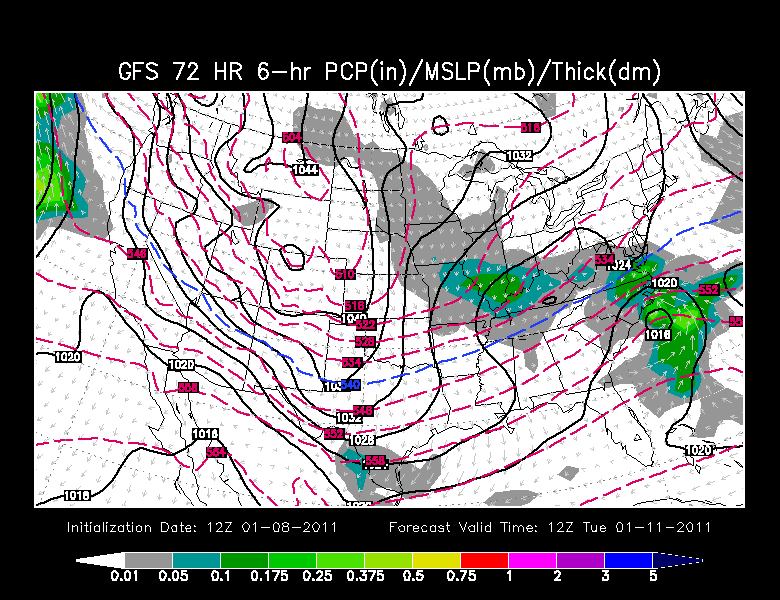 In the models shown above you can see a second wave of moisture moving through the Plains. This is what will move through Tuesday morning. Models have been hinting at there being enough moisture with the second wave to produce a measurable snow for the northern half of the viewing area. Here's a look at the Global forecast model Tuesday morning. This would be a fluffier snow so the snow ratio will most likely be a little higher. A general rule for snow is 1" of water equals 10" of snow. That ratio changes depending on a couple of elements such as air temperature. I think we could see a 14:1 to 17:1 ratio with the Tuesday morning wave. This would mean 1" to 2.5" of snow for the northern half of southeast Missouri and southern Illinois. One thing that is yet to be determined is how dry the air will be when the second wave comes through. If we are dry, we could cut the above number in half as the moisture that falls will evaporate.